Mayor of London Sadiq Khan has reiterated his calls for a diesel scrappage fund as he issued the seventh ‘High’ air pollution alert in the last 13 months. The ‘High’ air pollution alert is the seventh in 13 months. 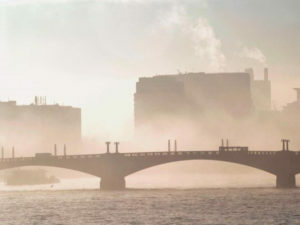 The latest episode of pollution was caused by toxic emissions blown over from Europe combined with ongoing air quality issues in London, with the mayor calling on the government to work close closely with the European Union post-Brexit to effectively address the problem. The mayor, who has led moves to introduce the T-Charge next month and bring forward the Ultra Low Emission Zone with even tighter standards in April 2019, said: “I am doing everything with the powers I have at City Hall and it’s now time for the government to step up by introducing a national diesel scrappage fund to rid our streets of dirty diesels, and to give me the powers I need to tackle non-transport sources of pollution.”For more of the latest industry news, click here.